Each #10 Can contains 10.4 ounces of Freeze Dried Whole Blackberries. 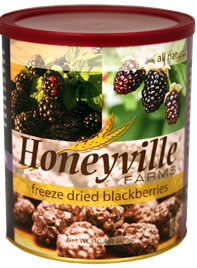 Honeyville's Freeze Dried Blackberries are produced in a process where moisture is removed from the frozen whole blackberry using a very low temperature and a vacuum. Only about 3% moisture remains in the product at the time of packaging. The end product weight is reduced by over 90%, while the volume stays the same. This remarkable process concentrates the fresh blackberry taste, natural color, and texture of fresh blackberry in it's freeze dried state. When re-hydrated with water the product will maintain the texture and shape of fresh blackberry, with no shrinking or shriveling. Freeze Dried and Dehydrated products are less expensive than wet pack food because you are not paying for all the water. The taste is great, and the nutritional food value is excellent. Freeze drying provides natural and additive free fruits and vegetables to be stored effectively for long periods of time. Remember Honeyville's Freeze Dried and Dehydrated fruits are stable products with a long shelf life without additives or preservatives. Our blackberries, or Marion berries, are naturally delicious, with no additives or sugar. Great for adding some flavor to your breakfast cereal, in recipes that call for fruit, mixed into yogurt, or for a healthy snack right out of the can. Each # 10 Can of Freeze Dried Whole Blackberries contains 10.4 ounces of product. 10.4 ounces of Freeze Dried Blackberry measures out to about 37 1/4 cup servings of dried fruit. A #10 can measures 7 inches tall and is a little over 6 inches in diameter, or roughly the size of a large coffee can. Shelf Life: Freeze Dried Blackberries may be stored in the sealed #10 can (with included oxygen absorber packet) for 5 to 10 years under ideal storage conditions (a cool, dry place).